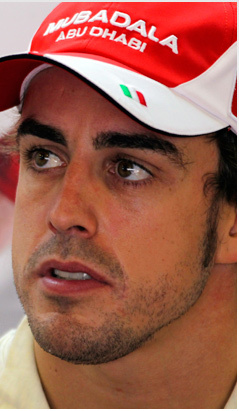 Five seasons have passed since Alonso won his second world championship. After galvanising Ferrari and coming within a badly timed pit-stop of taking the title in Abu Dhabi, he is now desperate to join the ranks of the triple champions. At his best, Alonso is fast, focused and utterly relentless, capable of taking a car that lacks a few tenths to the rest to wins by extracting the maximum out of it lap after lap. Having destroyed Felipe Massa last year, Alonso has potentially the best team in F1 fully behind him, starts the year hoping to continue his hot streak from the end of 2010.